Reliable operation, simplicity and ease of use are the hallmarks of every Philips Burton product, and the new APEX is no exception. For optimum illumination (120,000 lux / 11,148 fc at 1 meter), the highest quality no-drift arm system, reliability and true color rendering, there is no better value than Philips Burtons APEX. Plus, an efficient multi-bulb design eliminates the need for complicated back-up bulb systems used in single source lights. Our mission is to enhance your vision, your comfort and your performance in all exams and surgeries. For more than 80 years, healthcare professionals have chosen Burton lights for value, reliability and quality. Compare, and see for yourself the noticeably brighter lights with no increase in heat, designed and manufactured by Philips Burton. 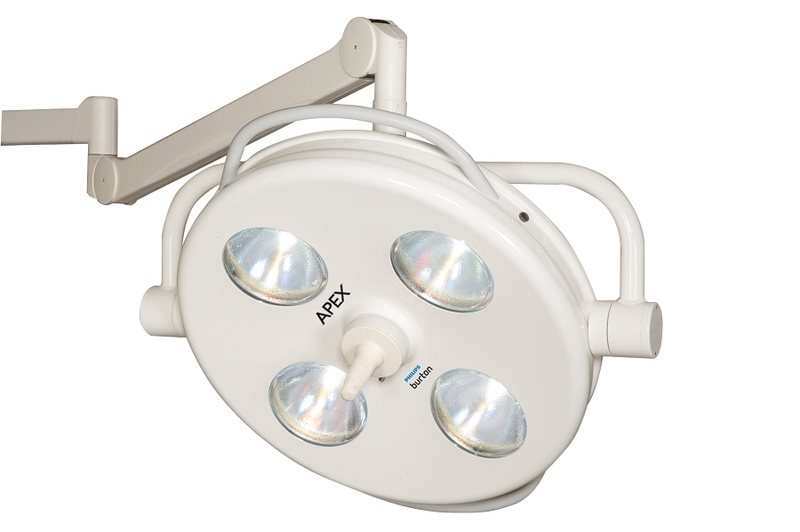 This catalog shows general descriptions and features of our Surgical, magnifier, under cabinet, patient and examination lights. We look forward to providing you with further information, specifications, pricing or product demonstrations. Philips Burton is a medical device manufacturer engaged in the business of designing, manufacturing and distributing high-quality examination, and surgery lighting equipment. Since its inception in 1928, Burton has been known for superior quality, exceptional value, and long-lasting solutions to complex lighting issues facing physicians, surgeons and veterinarians throughout the world. Philips Burton has over 250,000 lights installed in the United States alone and continues to grow based on its quality, reliability, and extraordinary five-year warranty. Philips Burton is part of Royal Philips and is located in Franklin Park, Illinois, just west of Chicago.